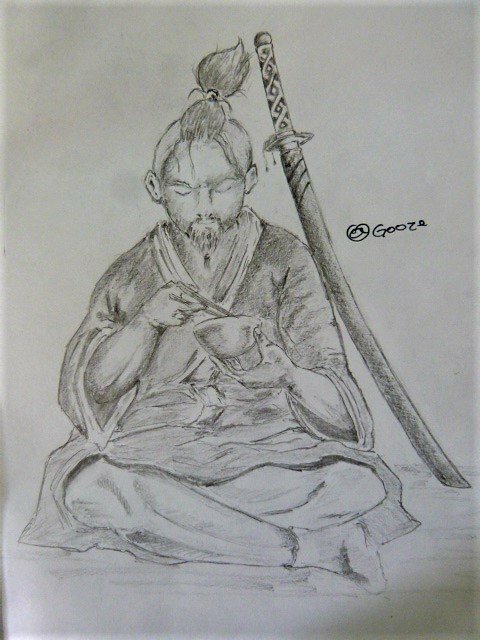 Working at a restaurant was inevitable that some day I would've drawn someone eating something, one of the dishes we have is fish's soup and when I saw a man eating from his bowl I thought that I might draw someone eating and as I love to draw samurais, warriors and such, I drew a samurai sitting on the floor eating his ramen. I think I have never drawn so many things without a reference image, so I am really thankfull for the job I found for two things. 1.- I'm working and eventhough the salary is not that great, is not bad either and I'm with great people all the time. 2.- I'm Drawing a LOT more on a daily basis than what I used to draw. So for artists out there, never stop drawing, even if it is one hour a day, it will make your day worth if you love what you do. This is a very cool and interesting drawing, @gooze. Well done! I really like samurais, I used to watch a lot of samurai manga some years ago :) Your drawing is terrific my friend, thanks for sharing it with us. The atmosphere around which this picture is wearing is exactly the samurai itself! And Thank you for mention! veryspider-san!